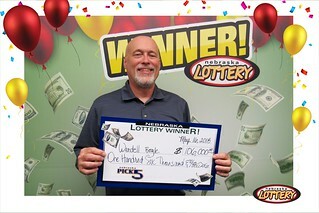 Wendell Bogle of Omaha won $106,000 playing Nebraska Pick 5 from the Nebraska Lottery. Bogle purchased his winning ticket from Hy-Vee Food Store at 5150 Center Street in Omaha. The ticket contained one play with the winning numbers (06, 25, 28, 32, 38) from the May 15 drawing. Bogle said he was thrilled when he found out his ticket was a winner after he checked the numbers on the Nebraska Lottery website, nelottery.com following the drawing. When asked what he’d be doing with the $106,000, Bogle said he wasn’t sure yet, but thought he’d probably pay some bills and maybe have a little fun.